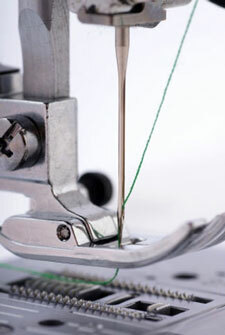 Threading a sewing machine properly will keep your thread at just the right tension, avoiding frustration down the road! 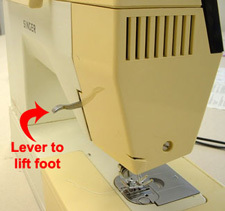 The following steps to feed the thread through your machine are designed to do just that. or to the back of the machine behind the needle. Raise the needle to its highest position by turning the handwheel towards you. This allows you to reach the needle's eye. With your spool of thread still on the spool pin, feed your thread around the thread guide on the top (or back) of the machine. 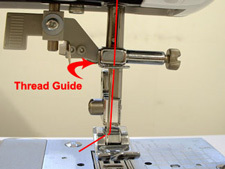 Now continue feeding the thread on through the thread guide on the front of the machine. 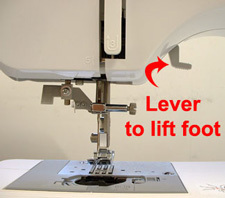 Next, feed the thread through the take-up lever from right to left. This is the part that goes up and down when you move the hand wheel. Sometimes there is a hole to thread through. Other times there's a slot you can run the thread through. 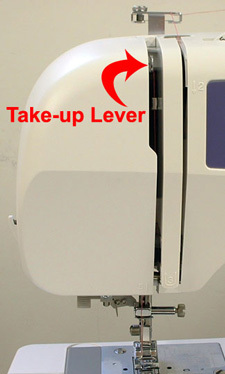 Bring the thread down the left side of the take-up lever. 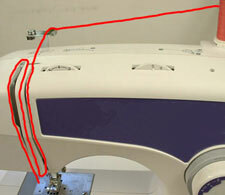 Run the thread behind the thread guide (located just above the needle). Let's finish up by threading the needle from front to back. Now pull the end of the thread down through the foot and out towards the back of the machine. Leave a tail of thread about five inches long. You are Done!